The Panasonic EW3122S Portable Upper Arm Blood Pressure Monitor lets you measure your blood pressure whenever and wherever you wish. It's ideal for anyone who wants or needs to keep careful track of their blood pressure over a period of time. You can trust Panasonic's blood pressure monitors to help you measure your physical health in the comfort of your own home. Their range of blood pressure monitors are among the most popular on the market because they're reliable, easy-to-use, and accurate. This blood pressure monitor includes a variety of beneficial features that make monitoring your heart health easier and more convenient. With these kinds of features available from the Panasonic EW3122S Portable Upper Arm Blood Pressure Monitor, rest assured that you will attain exceptionally accurate readings through each test. The Digital Filter Sensor detects and isolates only the essential pulse oscillation, eliminating other noise factors, leading to quick and reliable measurement capability. Panasonic digital technology allows for blood pressure readings to be taken during inflation to prevent over-tightening of the cuff. Quick and easy-to-use, one-touch auto inflate safely and comfortably inflates the cuff for measurements. The blood pressure monitor's display includes large, legible, and clear characters and intuitive symbols, which means reading your results is no longer a chore. 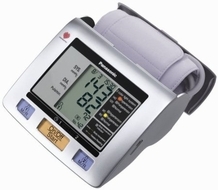 To ensure maximum accuracy, the blood pressure monitor will automatically detect an irregular pulse or arm movement and display a corresponding icon alerting you to retake the measurement. Accurate measurement requires correct cuff placement and keeping your arm or wrist still. Our Body Movement Sensor detects arm or wrist motion and alerts you when another reading is necessary. Flashing numbers alert you to readings indicating hypertension. The blood pressure monitor uses a three color light system to indicate if your reading falls in the hypertension, pre-hypertension or normal range. For the systolic measurement, red indicates hypertension (over 140); yellow indicates pre-hypertension (130-139); and green indicates readings in the normal range (under 129).